The Arbor Room at Popp Fountain is City Park's most recent addition to its already impressive stable of wedding facilities. This sprawling park has numerous venues for special events, large and small, including the Botanical Garden, the Pavilion of the Two Sisters, the Peristyle, Parkview Terrace, and the Conservatory. Additionally the Arbor Room is conveniently located adjacent to Popp Fountain, a large and magnificent structure that, with it's spacious brick paved area, makes a fabulous setting for an outdoor wedding ceremony, and is a perfect spot for the formal group photos and portraits of just the bride and groom. The Arbor Room is spacious enough to comfortably accommodate receptions with larger guest counts, and includes dressing room facilities for the bride. The building has a clean, modern appearance that photographs very well. 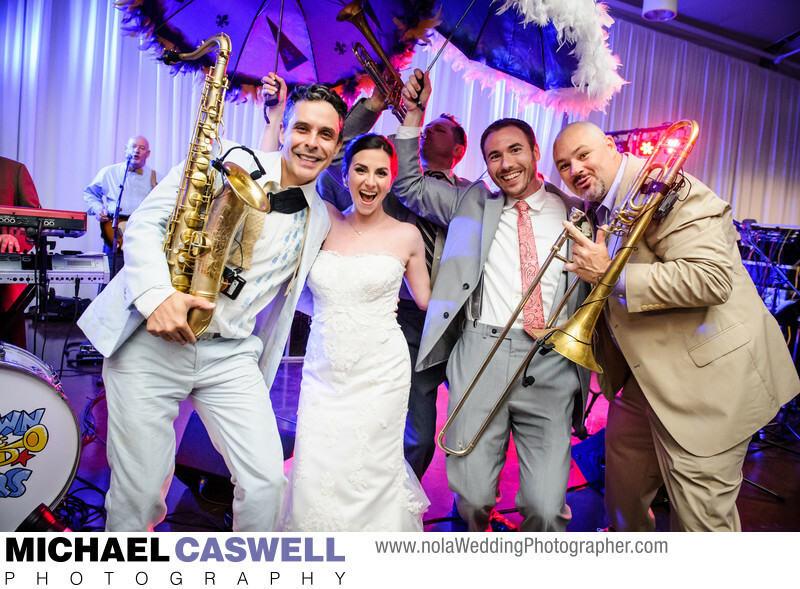 In this picture, the bride and groom are pictured with one of the most loved bands in the New Orleans area, the Bucktown All-Stars. In some cases, a band will consist of outstanding musicians that do a fabulous job at providing great music, and they might even put on an energetic stage show. But bands like the Bucktown All-Stars excel at not only their musicianship, but also in how they interact and engage with the couple and their wedding guests. I know whenever I walk into a venue and see this fantastic group of musicians setting up, it's going to be an amazingly fun night!